Hi, Happy Sunday. Had a great Thanksgiving with our daughter and her family. Everything was delicious and of course everyone ate too much! Friday morning she and I got up early and went shopping. We didn't go until 6 AM so missed that early morning craziness and long lines to check out. The mall was packed though. Yesterday, the entire clan including my husband went to see the new Harry Potter movie and I wrapped and cleaned while they were gone. We ordered Pizza and Wings for afterwards and celebrated my husbands birthday. Now that Thanksgiving and birthdays are over with, I guess we will concentrate on getting the Christmas tree and decorations up. Today's card is for the Penny Black Saturday Challenge.(#129). The challenge this week is Monochromatic Christmas. I chose the color red. The papers are by Martha Stewart. The bird border is Martha. The gingham snowflakes are a punch. Image is colored with Copics and glittered the fur on the hat. Wonderful! These birds are special! Meow!!! 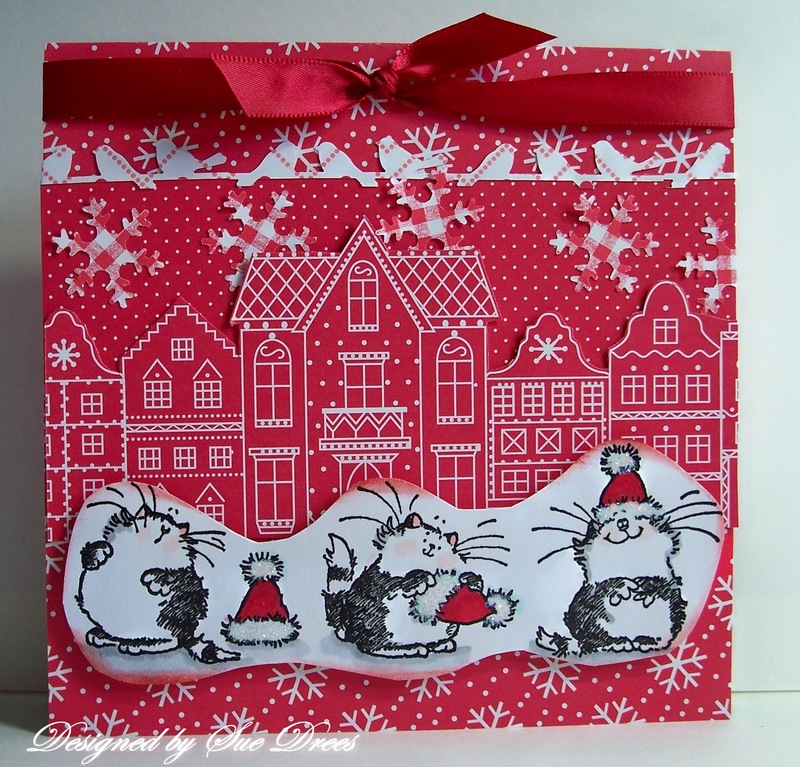 I am glad to hear that you had a lovely time with the family and gotten back into the craft room after the holiday!! Lovely card, monocrhomatic red, you are a master of craft!!! Love the image, very cute card!! that´s great that you are so busy in familiy celebrations! I wish you a good time dear Sue! 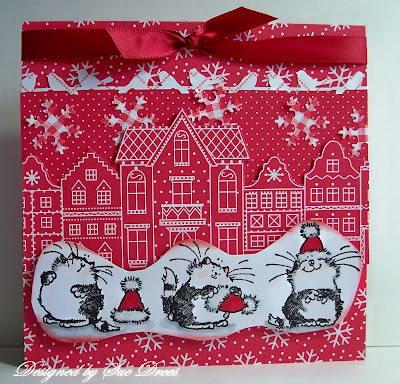 fantastic PB card Sue..I love those images and your wonderful special style with them! Sounds like a great holiday and birthday! Love this fabulous red card! Gorgeous card, love the fab image too. Oh my gosh...what a wonderful card!!! !